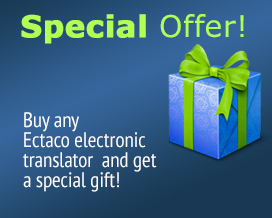 The ECTACO Partner EF800 is a revolutionary, expandable bilingual Dictionary and Travel Audio PhraseBook. With cool modern styling, hi-resolution color touch-display and state-of-the-art linguistic tools it is one of a kind. The massive vocabulary contains over 245,000 words and is one of the biggest around. The inclusion of the most sophisticated and accurate voice capabilities available on today’s competitive market is the defining feature of this remarkable handheld. It features both state-of-the-art English speech recognition and highly advanced English and French voice synthesis powered by the latest TTS (Text-to-Speech) technology. It even goes so far as to include crystal-clear native-speaker voices for both languages in the Audio Travel PhraseBook section as recorded by professionals. The ECTACO Partner Dictionary and Travel Audio PhraseBook ER800 is the most popular and powerful bilingual travel companion available. With its sleek modern design, hi-res colour touch-screen and state-of-the-art language tools, it is truly in a class of its own. The exhaustive vocabulary features an extensive dictionary with more than 1,030,000 entries. Yet the most remarkable feature of this sophisticated handheld is the inclusion of the most advanced voice facilities in the world. The ECTACO Partner Dictionary and Travel Audio PhraseBook RAr800 is the most popular and powerful bilingual travel companion available. With its sleek modern design, hi-res colour touch-screen and state-of-the-art language tools, it is truly in a class of its own. The exhaustive vocabulary features an extensive dictionary with more than 105,000 entries. Yet the most remarkable feature of this sophisticated handheld is the inclusion of the most advanced voice facilities in the world. As you would expect from the industry leaders, this unique device features both an advanced speaker independent speech recognition system and highly advanced Russian voice capabilities powered by the latest TTS (Text-to-Speech) technology. The ECTACO Partner Dictionary and Travel Audio PhraseBook RC800 is the most popular and powerful bilingual travel companion available. With its sleek modern design, hi-res colour touch-screen and state-of-the-art language tools, it is truly in a class of its own. The exhaustive vocabulary features an extensive dictionary with more than 150,000 entries. Yet the most remarkable feature of this sophisticated handheld is the inclusion of the most advanced voice facilities in the world. As you would expect from the industry leaders, this unique device features both an advanced speaker independent speech recognition system and highly advanced Russian voice capabilities powered by the latest TTS (Text-to-Speech) technology. The ECTACO Partner Dictionary and Travel Audio PhraseBook REs800 is the most popular and powerful bilingual travel companion available. With its sleek modern design, hi-res colour touch-screen and state-of-the-art language tools, it is truly in a class of its own. The exhaustive vocabulary features an extensive dictionary with more than 137,000 entries. Yet the most remarkable feature of this sophisticated handheld is the inclusion of the most advanced voice facilities in the world. As you would expect from the industry leaders, this unique device features both an advanced speaker independent speech recognition system and highly advanced Russian voice capabilities powered by the latest TTS (Text-to-Speech) technology. The ECTACO Partner Dictionary and Travel Audio PhraseBook RT800 is the most popular and powerful bilingual travel companion available. With its sleek modern design, hi-res colour touch-screen and state-of-the-art language tools, it is truly in a class of its own. The exhaustive vocabulary features an extensive dictionary with more than 185,000 entries. Yet the most remarkable feature of this sophisticated handheld is the inclusion of the most advanced voice facilities in the world. As you would expect from the industry leaders, this unique device features both an advanced speaker independent speech recognition system and highly advanced Russian voice capabilities powered by the latest TTS (Text-to-Speech) technology. The C-Pen 20 English <-> French Handheld Translator and scanner is a remarkably affordable and reliable solution for handheld data entry and translation. A unique alternative to fixed desktop scanners, this exclusive pack includes the remarkable C-Pen 20 and the award-winning LingvoSoft Talking Dictionary and Talking Translator software - providing data capture and translation opportunities you never though possible! By letting you import the exact segment of text you need, C-Pen 20 saves time and energy and helps avoid the mistakes that come from manual data entry. And by instantly inserting your scanned data into the LingvoSoft Talking Dictionary for individual words and Talking Translator for longer texts including letters and technical documentation - it provides instant translation of any English or French text - no matter where you find it! With their state-of-the-art TTS speech synthesis, LingvoSoft applications even pronounce translations out loud using sophisticated text-to-speech modules. Now you can import information for translation from curved, laminated and patterned surfaces as well as from magazines, books and wall-posters by simply waving the C-Pen 20 over the desired text. Connecting easily with your laptop or desktop PC, it is lightweight and extremely portable offering instant translation from places you never thought possible. Use it in the library, at the office or even on a plane. Able to recognize printed text in over 167 languages it lets you send English and French words, phrases or paragraphs from books or documents to your PC for translation and pronunciation - helping you understand more and learn faster. The C-Pen 20 English <-> Italian Handheld Translator and scanner is a remarkably affordable and reliable solution for handheld data entry and translation. A unique alternative to fixed desktop scanners, this exclusive pack includes the remarkable C-Pen 20 and the award-winning LingvoSoft Talking Dictionary and Talking Translator software - providing data capture and translation opportunities you never though possible! By letting you import the exact segment of text you need, C-Pen 20 saves time and energy and helps avoid the mistakes that come from manual data entry. And by instantly inserting your scanned data into the LingvoSoft Talking Dictionary for individual words and Talking Translator for longer texts including letters and technical documentation - it provides instant translation of any English or Italian text - no matter where you find it! With their state-of-the-art TTS speech synthesis, LingvoSoft applications even pronounce translations out loud using sophisticated text-to-speech modules. Now you can import information for translation from curved, laminated and patterned surfaces as well as from magazines, books and wall-posters by simply waving the C-Pen 20 over the desired text. Connecting easily with your laptop or desktop PC, it is lightweight and extremely portable offering instant translation from places you never thought possible. Use it in the library, at the office or even on a plane. Able to recognize printed text in over 167 languages it lets you send English and Italian words, phrases or paragraphs from books or documents to your PC for translation and pronunciation - helping you understand more and learn faster.